The days where nearly every big publisher had its plethora of fighting games on each console are pretty much over. Only the giants such as Tekken, Street Fighter and Dead or Alive seem to be what’s left when looking at the last few generations of consoles. We do sometimes see a small indie fighting game pop up, only to be forgotten a few days later, as it offers nothing memorable. 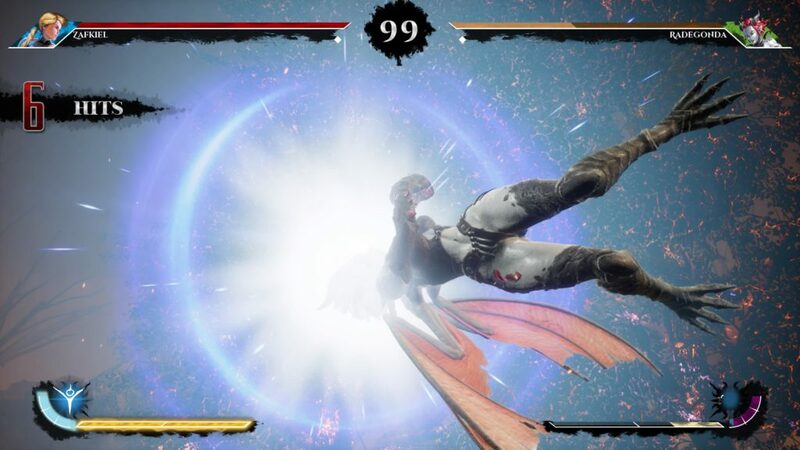 However, we noticed a speck on the radar a while ago that seemed to be very promising in the form of a fighting game that revolved around mythical characters loosely based on Dracula, or even the hunchback of the Notre Dame. Omen of Sorrow looked promising, and to a certain extent is actually worth looking into. The game offers three storylines for you to complete, all accompanied by enough story content to plow through. It all begins with the world being covered under a veil of evil, and you are trying to find the source and put a halt to it. Overall the simplistic plot does the trick for a fighting game such as this, but the presentation is found very lacking. You’ll have a lot of useless conversations to wade through before you can fight a few seconds, only to have the flow broken by even more useless conversations. The plot feels thin, and the writing is quite poorly handled, and these cracks show throughout the entire story campaign. That being said, playing the story is mildly amusing and it allows you to try out the characters that this game offers, allowing you to ease in what the game has to offer, if you play on a lower difficulty setting. Graphically Omen of Sorrow is a mixed batch. The character models look quite spiffy, albeit somewhat dated, but they are decently designed. The cast shows a lot of variety and overall most characters are very appealing to play with. The level design feels a bit lesser in quality, as it’s often just a moving background with a simply designed foreground. During cutscenes everything looks extremely bad, making it seem like these were the cinematics for a PlayStation 2 title, rather than a PlayStation 4 one. The special effects and the UI are properly designed, which is certainly a plus. The sound design in the game is also something that feels unpolished. The eerie music suits the game properly, but it sometimes feels a bit too subtle and calm for you to get the proper amount of adrenaline flowing through your body. The voice acting is non-existent during the story conversations, safe for a bit of (very dull) narrative during the cutscenes. Sometimes the narration starts looping for no apparent reason, which makes it feel like the creators didn’t even play the story mode themselves. For some reason, nearly every move that happens in the game is a ‘counter’ and the game will constantly yell ‘counter’ when fighting. This makes it quite obnoxious as it’s sometimes one of the few things that you’ll hear throughout the entire battle. 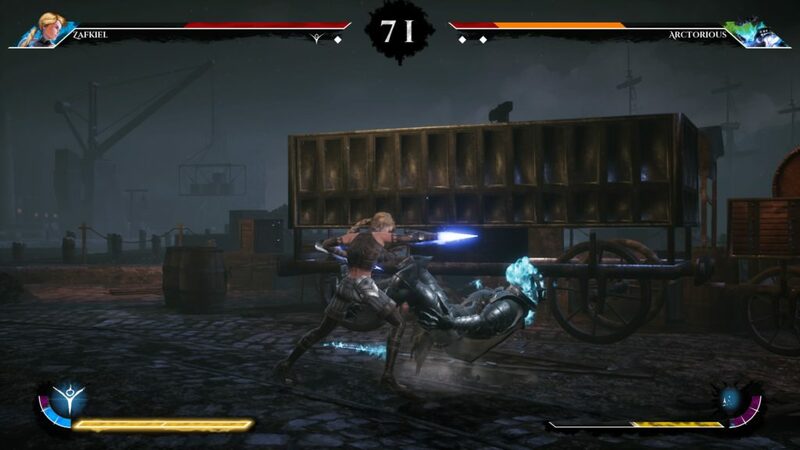 Omen of Sorrow is a fighting game with a very specific ‘gothic’ theme going for it. While the game offers different modes, it’s all about picking the character you like and stomp those who oppose you in combat. You’ll have a story mode to complete, but you can also opt for the arcade mode, the survival mode, practice your moves and if you’re up for the task, play online to fight other players. 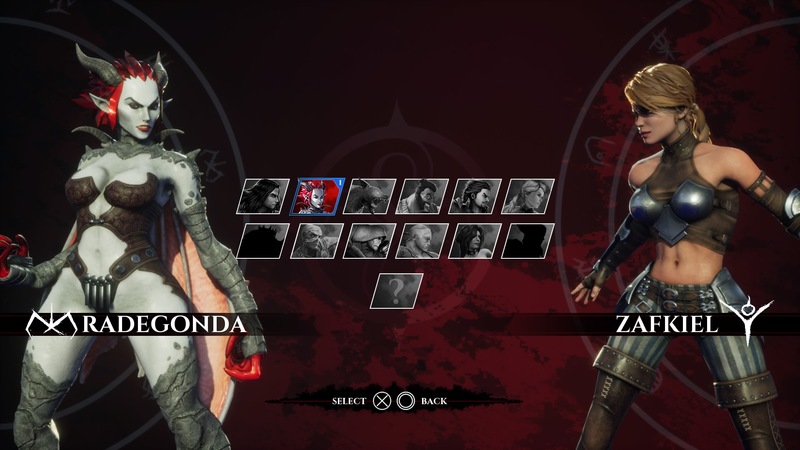 The game has a dozen characters for you to choose from, all with their distinct move-set and even unique ways of movement. There is a character that can fly, one that can cut his body in half, and so on. This makes it fun for you to try out all the different play styles for the cast of characters. Nonetheless, the game is a bit of a cheapskate in terms of a proper tutorial. The tutorial is simply a chart of which button does what, but there is no explanation about special moves, the gauges you can fill at the bottom of the screen and certain status conditions. All of this combined makes the game a bit tedious, if you want to jump in and properly learn the ropes. All of that being said, the amount of special moves is limited and the game seems a bit lacking in mechanics that other games seem to have to make them more competitive. Omen of Sorrow was a small dot on our radar when its first trailer went live, and while the game shows a lot of good ideas, it remains something small for in-between other bigger titles. While the graphical prowess is mediocre and the sound design is poor, the cast of characters is appealing and the overall mechanics are okay-ish enough for enthusiast of the genre to keep themselves busy for a short while. 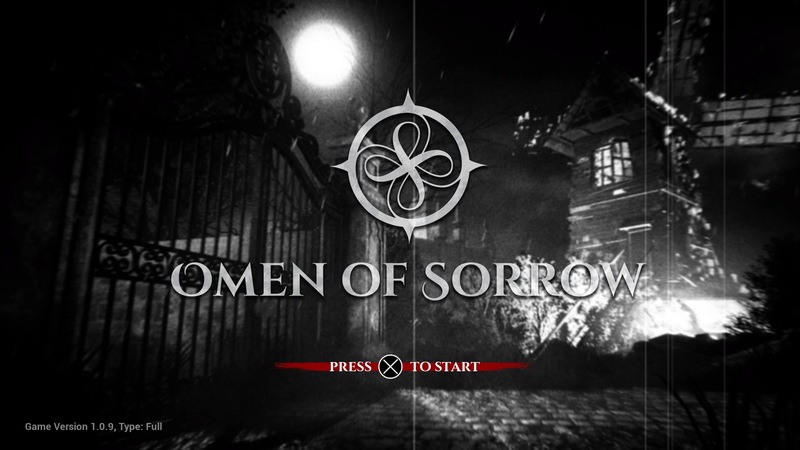 With some tinkering, a sequel to this series could be fairly impressive, but as it stands now, Omen of Sorrow is a tolerable entry in a genre that has many giants to cast a shadow over it.